Hey there everyone one! So today I have a Dupe or Not Video up on YouTube! I did a Comparison video long time ago for YouTube and I thought it would be fun to do another one. They are more fur to do a video with than just having a blog post so that is what I have done. In the video you even get to watch me swatching them. Also I am trying out a new tripod so things in my videos may be a bit off for the next so many. It's all about trial and error for those type of things. :) Click below to watch the video! 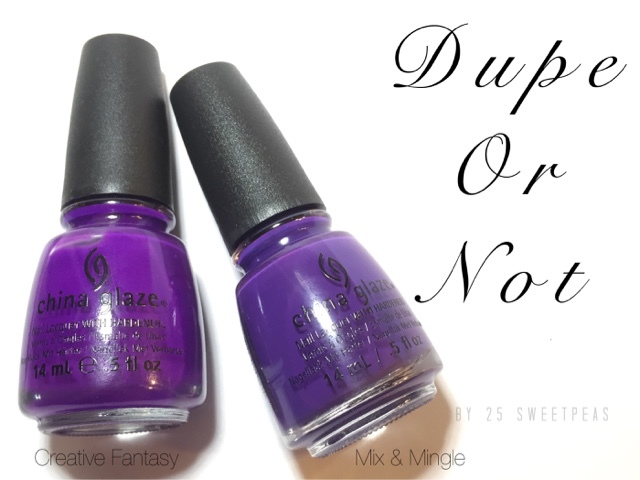 In the video I compared China Glaze Creative Fantasy and Mix & Mingle. :) in the bottle they look similar especially if you have one at home and are looking at the other in store. You really wouldn't know the difference. The good news is is that they are different. Creative Fantasy is very sheer on coat 1 and is watery. It typically takes 2-3 coats to get full coverage depending on how thick or thin you do your coats. :) Mix & Mingle is dusty compared to Creative Fantasy and has more of a blue tinge compared. It's first coat is really nice and really only needs one more. Again that depends on how thick/thin you do your coats. You do have to be care full about pooling. The formula on this one makes the polish move quickly. That being said you do have to watch for the polish speeding down the brush. Here is the official side by side photo. My index finger is Creative Fantasy and my middle finger is Mix & Mingle and that pattern goes on. They are both gorgeous colors and are definitely not dupes.